a person who has little status in society. Why does everyone love an Underdog? Is it their scrappy, never say die attitude? Is it their sheer will to win? - Or that they simply upset the status quo? In this spirit, we give you Underdog, a disruptive addition to the burgeoning downtown cocktail scene and a standout bar on historic Stone Street. 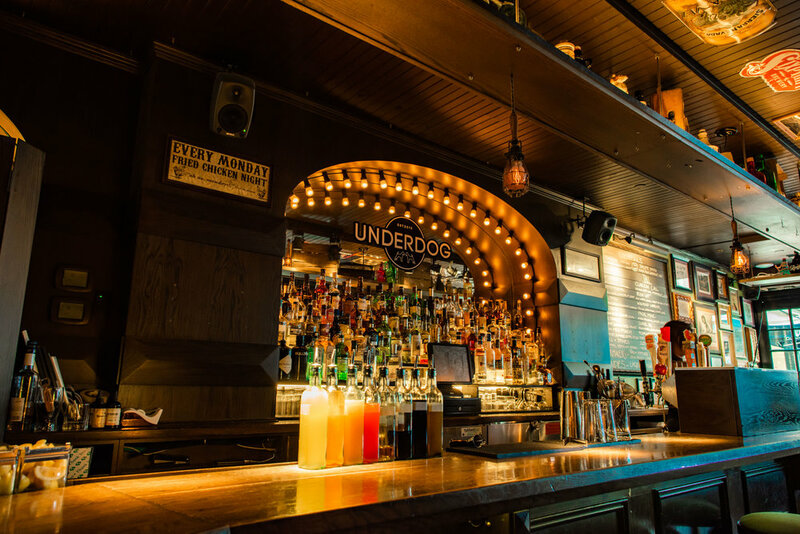 Founded in the basement of The Growler in 2013, Underdog quickly got a name for making world class cocktails in a relaxed neighborhood setting, an all vinyl music playlist and second to none bar snacks.…punching above its weight, so to speak. Fast forward to 2018 and Underdog has expanded to the entire first floor and outdoor café, offering the same world class cocktails alongside an enviable list of craft beer, spirits, wine and an expanded but equally excellent food selection. Our cocktail philosophy…. Take classic and often overlooked drinks and made them our own with fun, modern riffs on the originals. Separated into short and tall, we offer drinks that allow guests to enjoy both low ABV cocktails as well as spirit forward cocktails for the aficionados, all achieved with cutting edge techniques. Our hospitality philosophy…we take quality...but not ourselves…seriously.